Will Tiger Woods win The Players Championship? The Players Championship preview: Could Tiger Woods win? It’s time again for The Players Championship, the most major of the non-majors. And if it feels like The Players is here earlier than usual, you’re not wrong: the tournament has moved from May to March. Why? Who’s going to win? What’s up with the Island Green? All this and more in this handy preview. What are the big-picture details? Why the move to March? A domino effect. The PGA Tour was tired of its marquee playoff, the Tour Championship, getting steamrolled by the NFL in its September slot. So the Tour moved the Tour Championship to August, which in turn necessitated moving the PGA Championship, which in turn necessitated moving The Players. And here we are. It’s not unprecedented; The Players was held in March up until 2007. But it’s a bit of a departure from recent history, for sure. What effect will the move have? For fans, this gives us high-stakes golf events from March right on through August, and an unbroken run of majors from the Masters to the British Open. (No, The Players is not a major. We’ll get to that in a moment.) That’s a strong run of quality golf, and it wraps up neatly before the NFL season begins and devours everything in its path. From a weather perspective, March will change the way Sawgrass plays. The cooler weather will slow down and extend the course by not baking out the fairways. More importantly, the swirling winds of March are far different from the straightaway winds of May. This will come into play on the 17th and 18th holes; the 17th, as anyone who’s ever seen a motivational poster in a break room knows, is the Island Green, and you can imagine the effects that unpredictable gusts will have on that hole. So expect some drama in the closing holes, and if we’re lucky, in the final hours on Sunday. Who knows? We’re in one of those wide-open eras of golf, and there are a good dozen players who could step up and win and it wouldn’t be a tremendous surprise. Of the world top 50, the field at The Players includes … all 50. Yeah, this is going to be a battle. The list of past winners is all over the place, from Tiger Woods and Phil Mickelson to Jason Day and Rickie Fowler to Simpson and Matt Kuchar. The chalk-line favorite is Dustin Johnson, who’s currently World No. 1, coming off a win at the WGC-Mexico. He’s got the distance off the tee to outdrive any concerns about weather, and when his putter’s on, he’s damn near unbeatable. Also high on everyone’s list is Rory McIlroy, who’s playing incredibly well for three days of every tournament. But for whatever reason, he’s been unable to close the deal. Nine times in the last 14 months, including last week at the Arnold Palmer Invitational, he’s been in the final pairing on Sunday. Total number of wins from that position: zero. He hasn’t won since last year’s Palmer, and he’s starting to get The Question. Also playing in a What Have You Done For Us Lately spotlight: Jordan Spieth, who’s creeping up on two years without even a win. You’re going to hear more about Spieth’s troubles once we hit Augusta, but for now, it’s enough to note that one of golf’s biggest names is flailing, and there’s no sign whatsoever that this weekend will turn things around. On a brighter note, you could do worse than to back Justin Thomas, who’s fast establishing himself as the Voice of the Players; Rickie Fowler, who memorably carded three straight birdies at the 17th in 2015 to win; and Justin Rose, who might just be the purest tee-to-cup golfer in the game today. Other notable figures in the field include Mickelson, who caught some grief for denigrating The Players as an optional-play event, and Day, who withdrew from the Arnold Palmer Invitational after six holes. 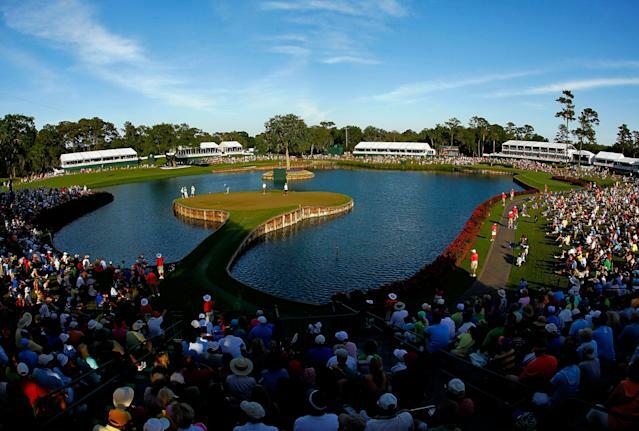 The Island Green will play a role in this week's tournament. He could! No, seriously, he really could. Woods has placed T20, T15 and T10 in his three tournaments this year, so he’s been reasonably competitive. He’s also won twice at Sawgrass, in 2001 and 2013, making him the only guy (so far) to win in both March and May. The key for Woods is putting. If he’s wobbly on the greens, the way he’s been for most of 2019, it’s going to be an ugly couple days. If he gets steady, he might just win his third Players … and then the talk of winning that 15th major will be hot enough to see from orbit. So is The Players the fifth major? Because it’s just not. Through decades of bureaucratic checkers and unfurling quirks of the game that have lasted so long they’ve turned into tradition, the PGA Tour doesn’t actually oversee any of the four majors (The Masters, the PGA Championship, the U.S. Open and the British Open), even though the Tour oversees almost all the other events on the annual schedule. The Tour wants its own spotlight event, but as we all know, you can’t make something a tradition just because you want it to be so, and you can’t just unilaterally declare the Players to be the fifth major. Maybe a promotion will happen some day many years hence, but for now, golf has four majors and no more, and The Players is the top dog on the junior varsity squad. End of story. Where do we watch all this? Here’s where to watch the Players Championship. All times Eastern. What are the key tee times? Justin Rose, Justin Thomas, Xander Schauffele: 8:32 a.m.*/1:27 p.m.
Dustin Johnson, Jon Rahm, Sergio Garcia: 8:53 a.m.*/1:48 p.m.
Phil Mickelson, Matt Kuchar, Rory McIlroy: 9:04 a.m.*/1:59 p.m.
For all the tee times, tap here. Enjoy the tournament!